Discover Rottnest Island’s history with a stay in one of our heritage listed cottages – each a treasured piece of history. Those staying in Heritage View cottages can enjoy waking up to a stunning view of the sparkling Indian Ocean. Heritage View cottages include the original lighthouse keeper’s cottage at Bathurst point, accommodation for the colonial settlement in the late 1800’s in North Thomson Bay (with a handful located on Vincent Way, one of the oldest intact streets in Australia), and the cherished Kingstown Heritage View cottages (with spectacular panoramic ocean views from your doorstep). 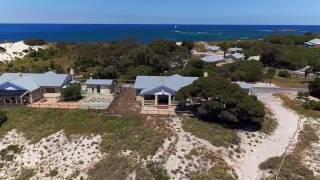 Built for commanding officers stationed on Rottnest during WWII, Kingstown Heritage View cottages are spacious and fitted out to reflect the status of the original occupants. Authentic recently restored art deco buildings, Kingstown Heritage View cottages are ideal with polished wooden floorboards, a large verandah overlooking the sea, and a comfortable outdoor seating area perfect for enjoying warm sunny days. Laid out with 3 bedrooms (each containing 2 single beds which can be made up as a king size bed if requested 48hrs in advance), a well appointed kitchen, separate living and dining area. All Heritage View cottages offer unique and charming layouts, and have been refurbished within the constraints of the heritage regulations. Cottages are self-contained and fully equipped with a 32” TV, lounge sofa, heater, linen, cutlery, crockery & gas BBQ. Heritage View Cottages are located in North Thomson Bay, Bathurst and Kingstown. The cottage featured in this video is Heritage View (Commander’s Cottage) located in Kingstown. EXPLORE this accommodation at your own pace through an interactive walk-through tour – also compatible for use with Virtual Reality Goggles! Abbie and Sam from Sightseeing Pass Australia had the opportunity to interview the boys from Rottnest Fast Ferries on their recent trip to Rottnest Island.